The DINION capture 7000 is a specialty camera designed to capture consistent, high-quality images of vehicle license plates. It is ideal for monitoring parking lots, public areas, and for controlling vehicle access. The DINION capture 7000 overcomes the problems encountered when using conventional surveillance cameras in vehicle identification and automatic license plate recognition applications. The Night Capture Imaging System delivers a burst of infrared illumination and simultaneously filters out visible light to ensure clear license plate images in complete darkness while eliminating the negative effects of headlight glare. Advanced Ambient Compensation minimizes plate overexposure from sunlight for more accurate automatic license plate recognition. Adjustable imaging modes allow for fine-tuning the imager for specific regions or license plate recognition algorithms. Finally, the overview camera provides a complete vehicle image in tandem with the plate image for positive vehicle identification. With an operational range of up to 28 m (92 ft), the DINION capture 7000 delivers high contrast number plate images across the complete spectrum of ambient lighting conditions, from total darkness to direct glare from sunlight and vehicle headlights. The camera can capture clear plate images from vehicles moving at speeds of up to 225 km/h (140 mph) enabling effective capture on motorways, highways and in other high speed applications. The DINION capture 7000 easily integrates with the Bosch Divar 700 Digital Video Recorder, the Bosch Video Management System, and with the Bosch Video client. The imager is also specifically designed to work with third-party ANPR software. The DINION capture 7000 uses high intensity short pulse width IR illumination to attain a crystal clear plate image while minimizing the effects of ambient light. Automatic Mode Switching can be used to overcome scenarios where the plate image may become overexposed, such as when the sun is behind the camera. The license plate imager camera and the overview camera use a 1/3-inch, wide dynamic range CCD sensors and incorporate advanced (20-bit) digital signal processing for outstanding picture performance. 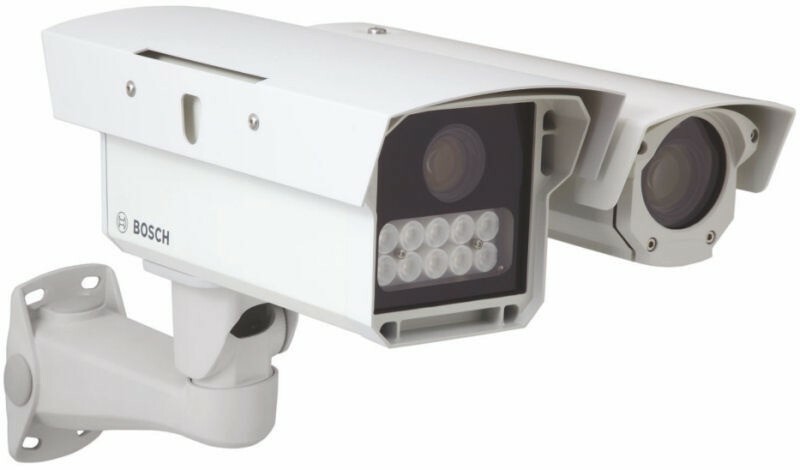 The highly accurate 20-bit digital signal is automatically processed to reveal every detail of the image in both the high- and low-light areas of the scene simultaneously. Capturing usable images of vehicle license plates is one of the most challenging problems in video surveillance, particularly at night. Typically there is not enough light on scene to properly expose the plate image and vehicle headlights only reduce the exposure making the plate image even dimmer. The DINION capture 7000 overcomes these problems by using the Night Capture Imaging System. The Night Capture Imaging system illuminates a license plate with a burst of infrared light and simultaneously filters out visible light ensuring clear license plate images 24-hours a day. The DINION capture 7000 uses Advanced Ambient Compensation to decrease overexposure, unreadable plate images, and false ALPR readings. Advanced Ambient Compensation combines high-intensity pulsed infrared illumination, and ultra-fast shutter, and automatic mode switching to deliver a clear, consistent license plate image, day or night.